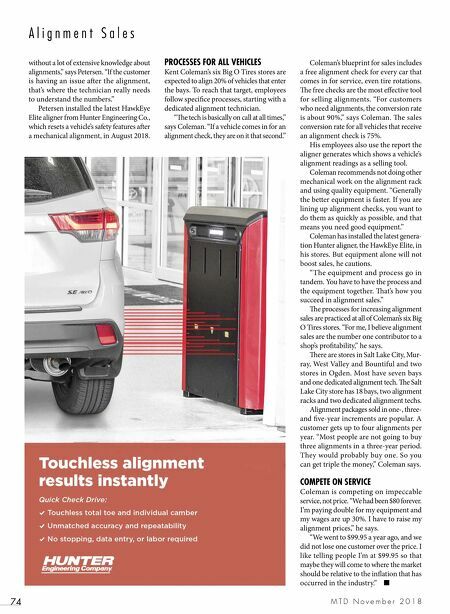 M T D N o v e m b e r 2 0 1 8 74 A l i g n m e n t S a l e s Coleman's blueprint for sales includes a free alignment check for every car that comes in for service, even tire rotations. e free checks are the most effective tool for selling alignments. "For customers who need alignments, the conversion rate is about 90%," says Coleman. e sales conversion rate for all vehicles that receive an alignment check is 75%. His employees also use the report the aligner generates which shows a vehicle's alignment readings as a selling tool. Coleman recommends not doing other mechanical work on the alignment rack and using quality equipment. "Generally the better equipment is faster. If you are lining up alignment checks, you want to do them as quickly as possible, and that means you need good equipment." Coleman has installed the latest genera- tion Hunter aligner, the HawkEye Elite, in his stores. But equipment alone will not boost sales, he cautions. "The equipment and process go in tandem. You have to have the process and the equipment together. at's how you succeed in alignment sales." 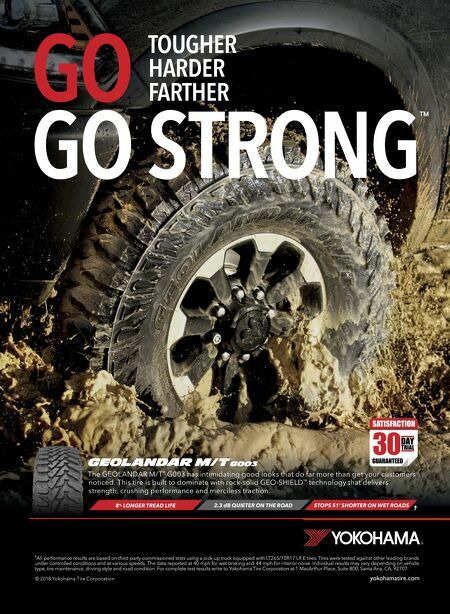 e processes for increasing alignment sales are practiced at all of Coleman's six Big O Tires stores. "For me, I believe alignment sales are the number one contributor to a shop's profitability," he says. ere are stores in Salt Lake City, Mur- ray, West Valley and Bountiful and two stores in Ogden. Most have seven bays and one dedicated alignment tech. e Salt Lake City store has 18 bays, two alignment racks and two dedicated alignment techs. Alignment packages sold in one-, three- and five-year increments are popular. A customer gets up to four alignments per year. "Most people are not going to buy three alignments in a three-year period. They would probably buy one. So you can get triple the money," Coleman says. COMPETE ON SERVICE Coleman is competing on impeccable service, not price. "We had been $80 forever. I'm paying double for my equipment and my wages are up 30%. I have to raise my alignment prices," he says. "We went to $99.95 a year ago, and we did not lose one customer over the price. I like telling people I'm at $99.95 so that maybe they will come to where the market should be relative to the inflation that has occurred in the industry." ■ PROCESSES FOR ALL VEHICLES Kent Coleman's six Big O Tires stores are expected to align 20% of vehicles that enter the bays. To reach that target, employees follow specifice processes, starting with a dedicated alignment technician. "e tech is basically on call at all times," says Coleman. "If a vehicle comes in for an alignment check, they are on it that second." without a lot of extensive knowledge about alignments," says Petersen. "If the customer is having an issue aer the alignment, that's where the technician really needs to understand the numbers." Petersen installed the latest HawkEye Elite aligner from Hunter Engineering Co., which resets a vehicle's safety features aer a mechanical alignment, in August 2018.